Sadly I've got to downsize as it's getting impossible to move in the garage and I'd like to start getting the Z1000ST on the road. Because of a fortunate H1A basket case on eBay I ended up building 2 at the same, and I'm going to keep one . . . and a H1 too . So here's one of my H1A's for sale, at a club price of £9,995. Thanks for the comments guys. It did get sold last weekend and although it's a sad loss I do have another H1A and an earlier red candy H1. I just love those old 2-stroke triples, gorgeous sound and smell. I remember when you were selling that UK H1A, Garry. They're rarer than rare and distinguishable by the oil pump cover. and the head-splitter front number plate!! I like the early 500"s and have owned a few over the years. Doing an early 69 H1 no 323 , hope to have in finished for the North west triples rally next month! Looking good Malc, which colour is going to be: grey or white? 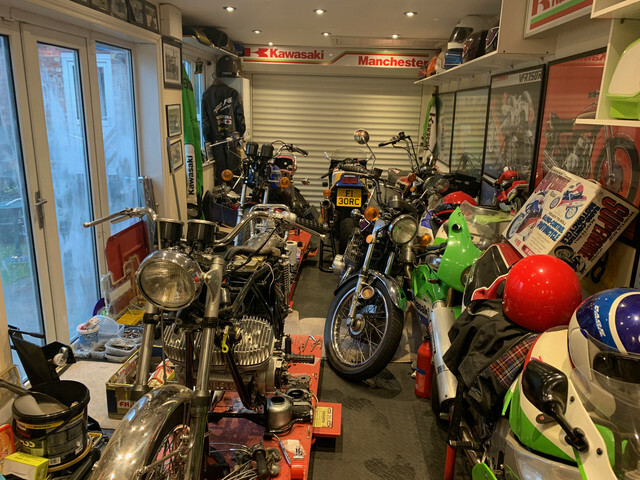 I also notice a nice collection of triples in there and a ZXR750K1 and the H1 version too. Great taste. Looks like you're well on your way to completion in time for the rally. The lighter nights help.